Waking up to ground frost is no fun! It hints the arrival of winter. It is at times like this I always turn to some old comforts to cheer myself up. It is precisely this thought that inspired me to cook one of my favourite dishes when I was growing up. Penang Laksa, also known as Assam Laksa is a rice noodle soup dish comes from the Malaysian island of Penang. The soup is made with fresh mackerel, tamarind and ginger or galangal. The fish is poached and then flaked and added back into the soup to thicken it.. Like most noodle soup dishes in southeast asia, this is then accompanied with lots of fresh garnishes such as mint, pineapple cubes, thinly sliced red onions, He-Ko, a thick sweet prawn paste, chillies and lime. All these add to the distinctive flavour, a kind of sweet and sour taste which is just perfect for weather like this. The original recipe is very close to my heart but is quite tricky to recreate as it contains lots of asian ingredients which might be hard to tracked down. So I have simplified it but this is just as good. All quantities are pure estimation as this is a recipe that's been passed down through generations and like any good old recipe, no exact quantities were given. Fill a pan with the water and add the mackerels, onion, celery, bruised ginger or galangal into the pan. Bring to the boil and simmer for about 5 minutes. Remove the fish and flake the flesh off the bones and then add the fish bones back into the pan and simmer for at least 1 hour. Strain and reserve the stock. Toast the piece of blachan either on a dry hot pan or on a skewer over a gas flame until it dries on the outside and gives off a strong smell. In a mortar and pestle, pound the chillies, blachan and onions into a paste or alternatively, blitz in a food processor. In a deep pan, fry the mixture in the oil over medium heat for several minutes to bring out the flavour. Add the tamarind, turmeric and sugar and leave to cook for about 10 minutes. Add the fish stock and adjust the seasoning. Prepare the noodles. Bring a pot of water to the boil and cook the noodle for 4-5 minutes depending on the instructions on the packet. Drain in a colander. To serve, bring the soup stock to the boil and add the reserved fish flakes. Tip the noodles into individual bowl. Top with the chillies, red onion ,cucumber, pineapple, lime and a few sprigs of mint. Spoon over some piping hot soup and serves while hot. 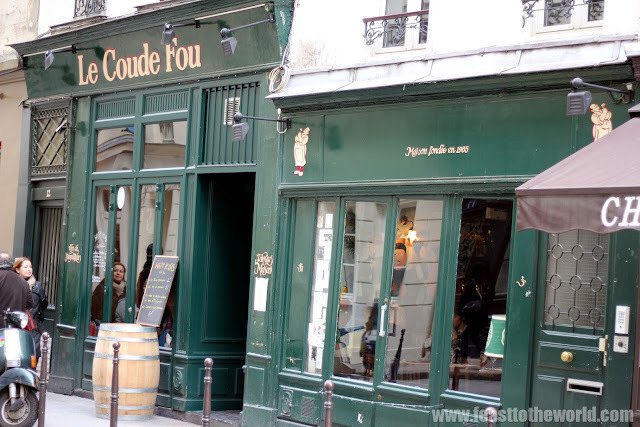 Le Coude Fou is without a doubt one of my favourite restaurant in Paris. 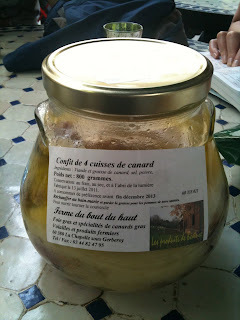 I stumbled upon this quaint and essentially french restaurant about three years ago when I first went to Paris. It doesn't have a fancy façade. What greet you as you stand outside the restaurant on Rue Bourg Tibourg is an almost worn down and humble forest green exterior. When when you enter, you are greeted by friendly and homely ambience. All the walls are decorated with humorous postcard murals that will put a smile on your face. 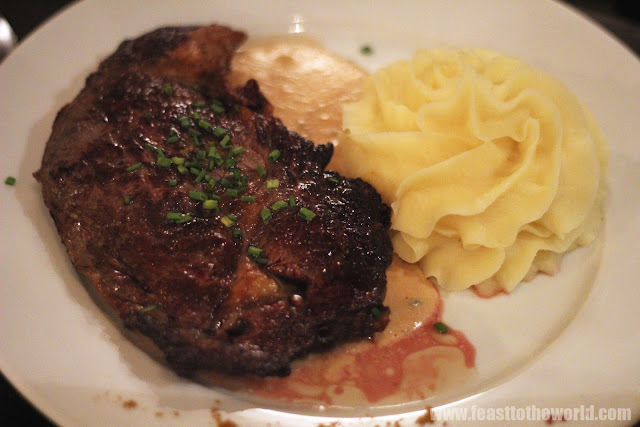 The menu are simple and typically french with dishes such as smoked duck salad, baked goat cheese salad, pan fried sole with beurre blanc etc, but my favourite has to be the entrecôte and mash. It's a simple dish but I have had my fair share of badly cooked steak in lots of restaurant. I like mine medium rare , however often I get them overcooked. Here, you get the most perfect flavoursome piece of steak that is cooked just right. The mash is creamy and smooth, just the way its meant to be. So if you get a chance, do pay this restaurant a visit, and if you are a steak lover like me, then this is a must on your to do list...I rest my case! I am a big fan of British food. What can be more British than fish 'n' chips? That lovely piece of fish steamed in a thin layer of beer batter as it is 'dancing' in hot oil. All the trimmings that go with it such as chips, mushy peas and of course the sound of the sea waves, as this is a dish best eaten by the English sea coast. It's the thought of this that inspires me to make a 'posh' version of this national dish of Britain. I started out by trying to see what alternatives to the often over fished Cod or Haddock. Then I came across Pouting, which is from the same family as Cod and way much cheaper and just as delicious as its distant cousin. After boning and filleting the fish, I coat it in a batter consisting of chopped fresh dill , cayenne pepper, cornflour, plain flour and ice cold beer. This produced an amazingly crunchy and crispy coating. To go with this, I've made an updated mushy peas by boiling some peas and then whizz it up in a food processor, together with a handful of fresh mint and a fresh red chilli for that little bit of kick. As for the chips, I've cut the potatoes into 1/2 in thickness and then parboil them, before adding them to a roasting tin with a mixture of duck fat, olive oil and sunflower oil which have been heated up nicely in the oven. This may seems excessive, which it is, but this produces the most flavoursome and crispy roast potatoes that I've ever known. I then pop the tin back into the oven for about 45 minutes. The tomato ketchup, well, this is more of a necessity than a choice as I am a great hater of any commercial ketchup, especially a certain well known brand whose name I dare not mention, not sure if they can sue me for it but I hate their baked beans just as much. I prefer Branston Baked Beans...oops...where's the delete button? Anyhow, to make the tomato ketchup, I've finely diced a large onion, a stalk of celery, a clove of garlic and an inch size of galangal/ginger and sauté them in a pan with some olive oil. To this, I then add a tin of chopped tomatoes, a tbsp of tomato puree, bay leaf, pinch of ground cinnamon, ground cloves and allspice, a couple tbsp of dark brown sugar, a dash of Tabasco sauce and Worcestershire sauce. Season with some sea salt and freshly ground black pepper and this is left to simmer for a good hour until it gets to a sticky and thick consistency. This is then left to cool and there you have before you a delicious and spicy tomato ketchup, way better than those bottled stuff I think. And the end product of all this hard work is what you see in the picture, a delicious homemade fish 'n' chips.